November Wahoo, Mahi, AJ, Rooster, ect. 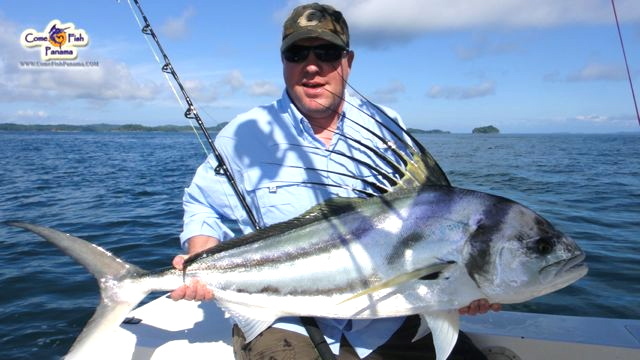 Come Fish Panama’s 2012/2013 fishing season officially opened on November 1st. This is the time of year when the rainy season starts to slowly give way to the sunshine of summer. Helping us start the new season were Jim, Landry, Kelly, Jose, Kevin and George. Our 1st week of November provided excellent conditions, with clear water and mostly cloudy skies. Winds were light and variable and seas were smooth. So off to the fishing grounds we went! be found during this time of the year. Once there, we started to deploy our Wahoo spread, and by the time the last lure was out, we had a screamer going. The fish were there and willing to accept our morning offering. Kelly was up first and holding tight with a Shimano Tiagra 16. The powerful fish made its last run, so Kelly went to work and had the Wahoo in the box within minutes. Out went the Wahoo spread and once again we had a fish on! Jim took this fish which had a longer initial run than Kelly’s. After a few minutes, this ‘Hoo made it to the box as well. We had multiple Wahoo hits that morning, so after Landry did his workout, we decided to move on to other species. 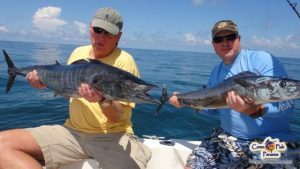 This is the beauty of offshore fishing in Chiriquí, Panama, a destination where you can catch countless species of saltwater game fish within a relatively short distance of each other. Making the turn around the island, we saw some Humpback Whales putting on a show for these “Sooners” that Sea World would be proud to have. Kelly mentioned he had seen them before but not that close, so I humorously told him that it was part of the Come Fish Panama Vacation Package. Back to the fishing we went and settled in on top of a spot that normally holds Mullet Snappers. The action was light today, but everyone got into the action and managed to hook fish for a boat-side release. After the Mullet Snapper action, we moved on to another drop that provided a different method of fishing. Kelly hooked up with an Amberjack and Jim got into the action right away with a nice, colorful Bluefin Trevally. 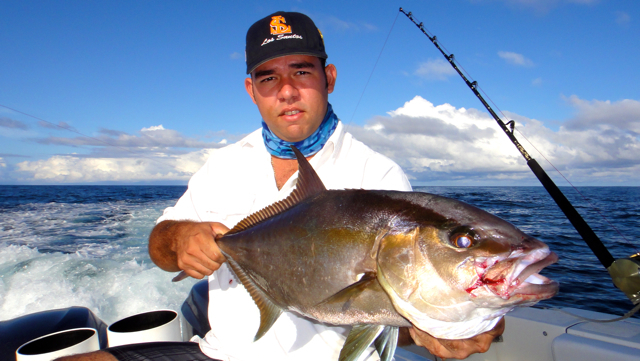 Blue Jacks, as they are commonly called, will put any angler’s tackle to the test. They are very tasty, often being compared to Lobster. But as usual, we let this one fight another day with Mate Turo having honors of setting it free. as if saying “me too”. Turo and I worked hard to give our guests a chance of fighting a Rooster. Jim and Kelly got their opportunity by catching and releasing a beautiful fish each. We tried to get Landry in on the Rooster action as well, but time ran out on us. We will certainly have to target that the next time he’s back with us. From all of us at Come Fish Panama, we would like to thank these boys for choosing to fish with us and open our 2012/2013 fishing season. We recognize there are other providers out there and appreciate them trusting us with their business. 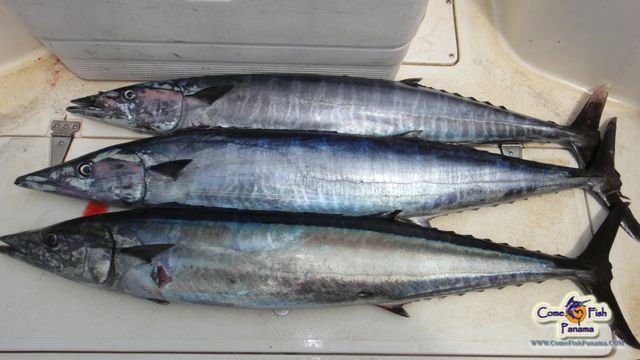 We look forward to taking them Marlin and Yellowfin Tuna fishing during the peak season in the near future. 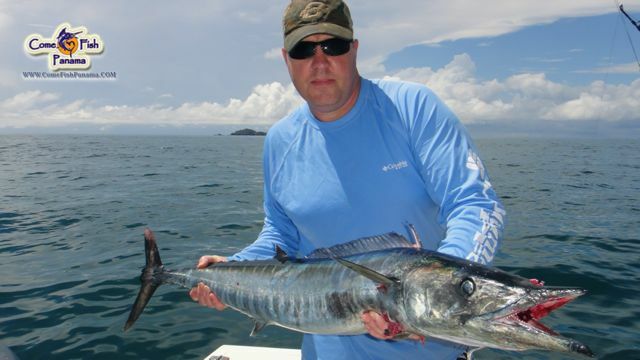 Panama Offshore Tips: If your looking for a very good Lure to troll here in Panama that will hook you up with Wahoo check out the “Wahoo Express” & “Rattle Head” place just behind the boat 2 wakes back and the “3.5 Slant Head Top Gun Lure” place long in the “Shotgun Position” are a must have the minute you leave the dock. Contact Darrell Primrose at ballyhood for more information, just make sure you have Darrell rig your 3.5 Slant Head with cable for the Wahoo..